Since 1995 I have been a fan of Robert Kiyosaki. Reading Rich Dad Poor Dad changed my life. I had no positive financial education when I was growing up so the information in this book was like manna from heaven. Since then I have read everything that Robert Kiyosaki has written and put his financial teaching into action. Based on these actions I have gone from living in the back of my veterinary clinic and working 70 to 80 hours a week to living on my own 20 acre farm and working 30 to 40 hours a week doing what I love. This last book by Robert Kiyosaki is a bit different. 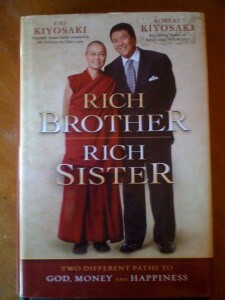 This one is written with his sister who is a buddhist nun. Robert and Emi took very different paths in life and this book explores what lessons they both learned and how they came back together to share their knowledge. Robert helped Emi learn about becoming financially rich and Emi helped Robert understand better the importance of spiritual richness. According to Robert we have two financial statements. One is our personal financial statement. This statement shows our personal assets and liabilities: how much we earn and spend and owe. The second is the social accounting statement that shows us how much good we have done on earth: how many people, places or things we have served. This entry was posted in Network Marketing on December 18, 2009 by Madalyn Ward, DVM.